In England you can drink shandy and in Australia you order a radler. Shandy is approximately half and half, beer and lemonade. A radler actually originates in Germany and describes beer with added citrus to slake a cyclist’s (radler’s) thirst. In the United States Budweiser have been marketing beer with added lime to help cool us in the summer. I don’t even want to think about Budweiser and Clamato! Someone must drink it, but I’ve never met them. 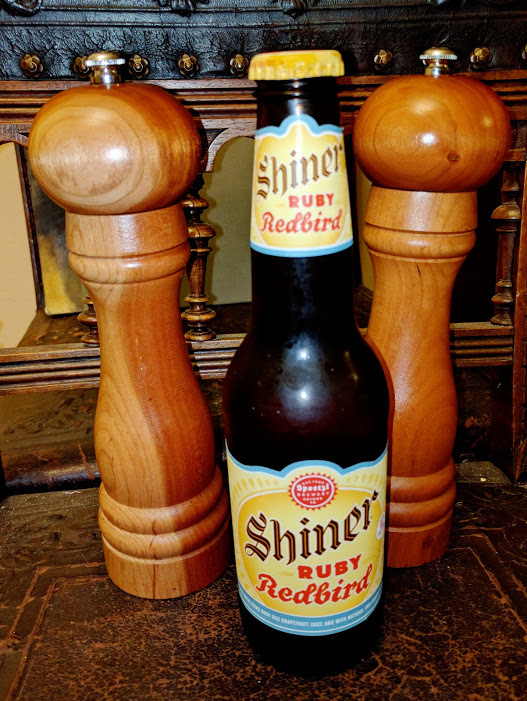 Now the good folks at Spoetzl Brewery in Shiner TX, makers of Shiner Bock, have brought us Shiner Ruby Redbird – an amber beer with added grapefruit and ginger. I am a huge fan of ginger in all of its forms (more on that over the coming months) and grapefruit has become one of my go to additives to gin in the summer (Salty Dog/Pink Dog). I picked it up without any real expectations. I am here to report that the grapefruit flavor is well up front with distinct ginger after-taste. Neither one are strong enough for my taste, which probably means that it will suit the general public just fine. For me, it probably isn’t going to be a staple item in my fridge. However, after a day of yard-work, it may just hit the mark. Generally speaking, meh.